Every UMWA member’s job or retirement security is directly affected by the outcomes of elections. Whether it’s rules regarding health and safety on the job; your right to speak out and organize a union; the security of your health care and pension benefits; or government actions that threaten the future of your job, Social Security or another benefit you need, elections matter to every UMWA member. The UMWA COMPAC program is designed to give UMWA members the strongest voice possible in the elections process – and in making sure our voices are heard after elections as well. Just like the UMWA itself, the UMWA COMPAC program is as strong as the membership makes it. COMPAC is built from local union committees on up to the National Council of COMPAC, which is comprised of the International Executive Board. Click here to see the latest list of endorsed candidates from your state. 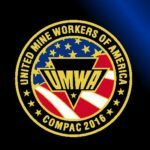 Want to Contribute to UMWA COMPAC?